What do you think are the most exciting things happening in education today? As always, many things are happening in the education world today—in instruction, in policy, in leadership. This series will explore what teachers think are the most exciting among them all! Perhaps they can serve as inspiration for those of us doing the work every day. Today's contributors are Tricia Hyun, Sarah Thomas, former U.S. Secretary of Education John B. King, Jr., Mandi White, and Tara Dale. You can listen to a 10-minute conversation I had with Tricia and Sarah on my BAM! Radio Show. You can also find a list of, and links to, previous shows here. I have several choices for what I think are the most exciting newer education developments. One is the renewed emphasis—from many educators—on culturally responsive teaching, including restorative practices. Secondly, the increasing recognition that schools must recruit and support more teachers of color. And, thirdly, the heightened awareness that Social Emotional Learning needs to be a key component of classroom practice. When someone asks me, a teacher-leader, a question about what is most exciting in education today, I have only one answer in mind: Strength-based, teacher driven change. Using a strength-based approach, teacher-leaders across California are driving school change that matters to the students. Teacher-leaders are not only leveraging their own and their students' strengths, but also utilizing these strengths to create a culture of academic, physical, emotional, and social success for all children. 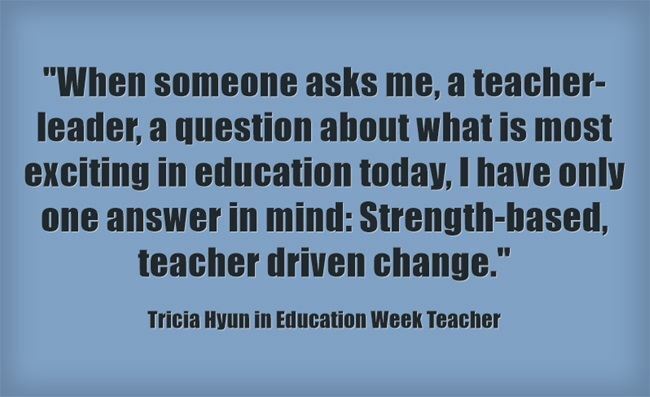 Teacher-leaders across California are continuing to have significant impact on their students' lives because of their passionate focus on strength-based, teacher driven change. Over the last three years, I have had the most rewarding opportunities to meet hundreds of teacher-leaders through three engaging, teacher-centered organizations: the California Teachers Association (CTA), the Institute for Teaching (IFT), and the Instructional Leadership Corps (ILC). These three organizations have one impressive commonality: All have an unequivocal respect for teachers. These organizations are providing teacher-leaders with professional development opportunities that have an intentional focus on the greatest student learning outcomes. By accessing opportunities to balance between classroom teacher and teacher-leadership experiences, these teacher-leaders are collaboratively growing in content-focused, active-learning environments (i.e. Think Tanks, Strength-Based Education Summits, Good Teaching Conferences, and Learning from the Field Conferences). Experientially, these teacher-leaders are utilizing their expertise, coaching one another while drawing on colleague-to-colleague feedback and personal reflections. Ultimately, these teacher-leaders find themselves immersed in personal engagement and excitement for teaching and learning, and then, naturally, in the fall, their students come to discover the most powerful teaching and learning environment ever—their classroom. For me, the most exciting thing happening in education today is the democratization of education. For a long time, it seemed as though education was extremely top-down. It was as if we were supposed to wait for a magical expert to give us all the answers. However, I'm seeing more and more that educators are reclaiming their voices and telling their stories. We all have something we do well, and it benefits the profession for us to share. As a matter of fact, anyone can be an expert at something... I see educators around the world realizing that, and empowering their inner expert. Grassroots movements are hot right now, and will hopefully stay that way forever. Who is better to solve a problem than the user? Response From John B. King, Jr.
To be sure, there are many exciting things happening in American public education today. More of our youngest learners are developing a strong foundation for success in school and in life through quality early childhood education. More students are experiencing high expectations and the joy of learning through rich, well-rounded curricula. More young people are graduating from high school than ever before; and, since 2008, a million more African-American and Latino students are enrolled in college. Teachers are tailoring instruction to individual student needs and interests through personalized learning and leveraging information about student performance. Many schools are expanding access to hands-on learning in science, technology, engineering, and math, enabling students to gain knowledge and skills for the jobs of today and tomorrow. Many districts are making it a priority to ensure that their schools are safe and welcoming through culturally competent teaching that can help provide every student with a positive environment for learning. Many communities are making it a priority to increase the racial and socioeconomic integration of their schools, understanding that our nation's diversity is one of its greatest strengths. And all states are creating plans to implement the new Every Student Succeeds Act (ESSA)—a law that builds on the civil rights legacy of the original Elementary and Secondary Education Act of 1965 and that holds the promise of helping educators, policymakers, and others to expand educational excellence and equity to every child. All of these things are promising, but I'd like to answer your question about the most exciting thing happening in education today in another way. And that entails describing what I think most about each day—and maybe even what keeps me up at night. I have often said that the U.S. Department of Education is a civil rights organization, and that one of the agency's urgent responsibilities is to protect the right of all students—including and especially those who are most vulnerable—to an education that opens doors to opportunity and the American Dream. But the Trump administration continues to take deeply troubling steps to weaken federal civil rights enforcement. To me, this is among the most pressing issues in education right now. And it should be an area of concern for educators, parents and families, advocates, and everyone who cares about kids. Indeed, across federal agencies, the administration has made decisions that would diminish the capacity and authority of civil rights divisions and programs. At the Education Department, misguided proposed federal budget cuts would reduce the ability of its Office for Civil Rights (OCR) to proactively examine claims of harassment, discrimination, and unequal access to education in our K-12 public schools, colleges, and universities. Recently, the administration also confirmed its intention to dramatically reduce OCR's investigative efforts, which could have the effect of allowing systematic violations of students' civil rights to go largely unseen and unaddressed. For historically underserved students, including the more than 4.8 million English learners in our public elementary and secondary schools, weakened federal civil rights enforcement means that these students will continue to get less access to quality teachers, less access to advanced coursework, and less access to the resources and services they need to succeed. But if we fail to educate our growing population of English learner students (ELs), we fail as a country. The percentage of public school students who are ELs has increased over the last decade or so in all but 15 states. In states such as California, ELs make up nearly a quarter of the student population. A look at achievement gaps between ELs and their peers who speak English at home demonstrates that we have much further to go to better serve students who are learning English. For example, the gap between ELs and non-EL students is 36 points in fourth grade reading on the National Assessment of Educational Progress. By 8th grade, the gap in reading achievement reaches a staggering 44-point differential. And EL students continue to struggle throughout their K-12 educational experience when only 63 percent graduate from high school, compared with 83 percent of students overall who graduate nationwide. As a country, we must do more to ensure that ELs can access the programs and services they need to attain English proficiency and to achieve the same rigorous academic performance standards that all students are expected to meet. When I was commissioner of education for New York, the state instituted a blueprint for English learners' success; and, as a part of the plan, all teachers—regardless of grade level or content area—considered themselves teachers of students learning English. The plan also held principals and superintendents accountable for the academic, social-emotional, and language development of EL students. Because of robust federal civil rights analyses and investigations, however, we know that in far too many areas throughout the U.S., ELs have little or no access to high-quality instruction that is tailored to their specific needs. OCR proved integral in finding that there are more than 120 school districts in the U.S. where not a single student is enrolled in an English language learner program. And, overall, as many as half a million students do not receive any special instruction in their schools to learn English. A 2014 investigation also found that EL students can experience unequal access to core academic courses that are typically requirements for college. The investigation showed that in the Cleveland Metropolitan School District (CMSD), Hispanic high school students were not provided with equal access to science, technology, engineering, and math (STEM) programs. OCR's investigation revealed that the underrepresentation of Hispanic students in STEM largely resulted from the district failing to make information about these opportunities available in languages other than English. CMSD also had not engaged in significant outreach to limited English proficient students, despite the fact that more than half of Hispanic students in the district had been identified as English learners. As a result of the investigation, CMSD agreed to create a plan to ensure equal access to STEM educational opportunities for all students districtwide. And administrators agreed to ensure that Spanish-language materials about the programs were made available to families, and programs were promoted to English learners. OCR's work is absolutely necessary to identify and rectify often hidden, systematic institutional violations of students' right to an education that will prepare them to thrive in school and in life. That's why the Trump administration's efforts to diminish the capacity of federal civil rights enforcement in education is fundamentally wrong. I am deeply disappointed by the early activities of the administration, especially with regard to civil rights enforcement. To this point, the administration has been opaque at best about how it would interpret and enforce federal civil rights laws in education for ELs, students of color, LGBT students, victims of sexual assault, and other vulnerable young people. But, contrary to false debates in Washington, it is the responsibility of the U.S. Department of Education to ensure that these laws are enforced vigorously and uniformly across the country. It's my sincere hope that the Trump administration will reverse its current course and embrace the need for strong, uncompromising federal protections of students' civil rights in our public schools. One thing that heartens me in this work is our new education law, ESSA. For ELs in particular, the law holds great promise for expanding students' access to educational equity and opportunity. The law shines a bright spotlight on the needs of ELs and holds states accountable for the progress of EL students—both in their development of English language vocabulary and skills and in their mastery of the core academic curriculum. The law also holds states and schools accountable for other measures of EL student success, including their high school graduation rates. What's more, educators have an opportunity through ESSA to give EL students—and all students—the gift of bilingualism and multilingualism so they are prepared for college and careers and gain a better appreciation for the diversity of our country. ESSA can be leveraged to support quality dual-language programs, which, research shows, provide students—and particularly ELs—with numerous benefits. Students in these programs engage in rigorous curricula that promote bi-literacy. They are exposed to cultures and experiences that may be different from their own in classrooms where racial and ethnic differences are viewed as assets. For ELs, they have the opportunity to leverage the language that they speak at home as a tool to support the learning in their classroom. And, by studying a second language, students gain skills that can expand their employment opportunities as adults. Importantly, ELs instructed through dual-language programs achieve at or above their peers, while students in traditional English immersion programs lose or do not make progress in their native language. Dual language programs also can be used by schools and districts as a way to lead to the voluntary creation of more integrated schools. And reams of research point to the academic and social benefits associated with diversity in education. It's promising that, across the country—from California to Kansas to Connecticut—many states, districts, and schools are adopting the Seal of Biliteracy, recognition given to students who have studied and attained proficiency in two or more languages by high school graduation. This seal rightly elevates the status of bilingualism and multilingualism in America. 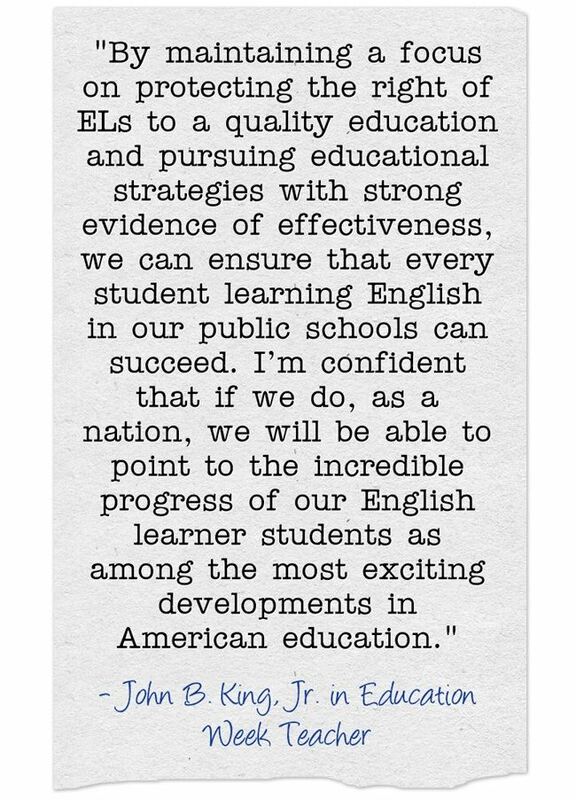 By maintaining a focus on protecting the right of ELs to a quality education and pursuing educational strategies with strong evidence of effectiveness, we can ensure that every student learning English in our public schools can succeed. I'm confident that if we do, as a nation, we will be able to point to the incredible progress of our English learner students as among the most exciting developments in American education. Mandi White earned a Master's of Education in Special Education from James Madison University in Harrisonburg, Va. In 2007, she moved across the country to begin her teaching career in Phoenix, Ariz., as a cross-categorical resource teacher for 7th and 8th grade students. After five years of working as a resource teacher, Mandi made the switch to general education and began teaching seventh grade English Language Arts. During her five years teaching ELA, she earned a second M.Ed in Educational Leadership from Arizona State University. Mandi began her new position as an Academic and Behavior Specialist in July of 2017. While there is much turmoil and uncertainty in education today, we believe there are still many aspects to be excited about. Probably the most exciting is the shift away from traditional lecture direct teaching to more project-based cooperative learning environments. The best part of this is the change it creates with our students, who are our future leaders of this country. They are becoming more creative thinkers and problem solvers, not just memorizers who spout back useless information and cannot truly think for themselves. As educators, we need to be preparing students for the future by giving them the 21st century skills to be successful. With technology today, anyone can easily look up concepts, such as moon phases or the first battle of the Civil War. Instead of teaching memorization of random concepts, we need to be teaching students to be critical and creative thinkers who can collaborate. We are preparing students for future jobs that have not even been created yet, so we need to give them universal skills to make them valuable commodities in the future. Have you heard of the fear of humans being replaced in the workplace by artificial intelligence? This is a real fear many have. In order to prevent this, future workers need to have the creative and critical thinking skills to ensure they are irreplaceable. It is up to us as educators to build these. One way to build and foster these 21st century skills in students is through project-based learning. This requires allowing students to gain knowledge and skills by working together for extended period of times investigating and responding to a real world problem, question or challenge. Project-based learning is not only exciting because it builds the skills needed for students to be successful in the future, but also helps by utilizing various technologies, learning styles, and makes learning more relevant and engaging for students. While there are many teachers out there who still rely on lectures the majority of the time, we are encouraged by the increasing amount of teachers utilizing project-based learning in their classrooms. Are you worried about completely shifting your instructional practices alone? Have no fear, your colleagues are there to help. Through professional learning communities (PLCs), teachers are collaborating more and more, which ultimately benefits students the most. 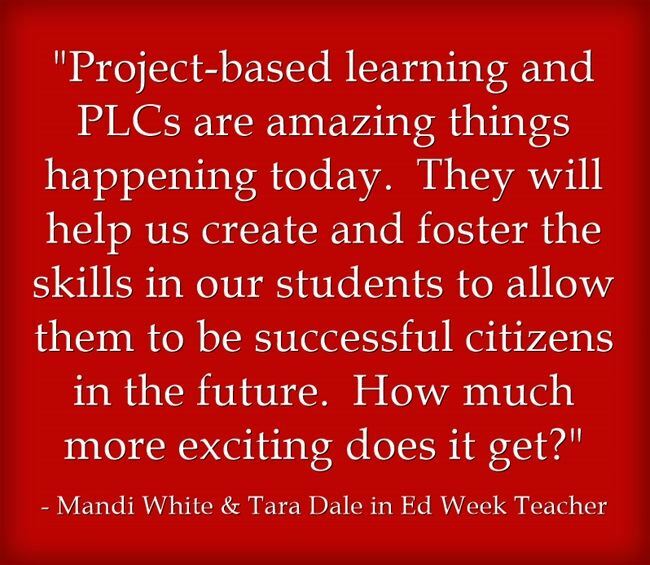 This is why PLCs are another exciting thing happening in education today! PLCs allow teachers to work together to determine student needs based on data and prepare engaging and rigorous instruction to meet these needs while ensuring the curriculum is being taught. What an excellent way to create lessons utilizing project-based learning! Bringing together multiple brains to create and build on ideas is always better than one person doing everything. We know from experience through working together on creating this blog post! So, while it is easy to turn negative in education today, we encourage you to seek out the positives. Project-based learning and PLCs are amazing things happening today. They will help us create and foster the skills in our students to allow them to be successful citizens in the future. How much more exciting does it get? Thanks to Tricia, Sarah, John, Mandi, and Tara for their contributions! Consider contributing a question to be answered in a future post. You can send one to me at [email protected]. When you send it in, let me know if I can use your real name if it's selected or if you'd prefer remaining anonymous and have a pseudonym in mind. Education Week has published a collection of posts from this blog, along with new material, in an e-book form. It's titled Classroom Management Q&As: Expert Strategies for Teaching. Just a reminder—you can subscribe and receive updates from this blog via email or RSS Reader. And, if you missed any of the highlights from the first six years of this blog, you can see a categorized list below. They don't include ones from this current year, but you can find them by clicking on the "answers" category found in the sidebar. Look for Part Two in a few days..